is valued above all else, great things are possible. Bhutan was the last country to introduce global media such as television and internet, this tiny country is poised to take a leap forward in cultivating and sharing “social happiness” with the world through a children’s television network. HummingbirdTV will produce sustainable commercial-free and non-violent content that embodies the ideals of Gross National Happiness. Help Us Preserve the Future of Bhutan. Here are some ways you can help HummingbirdTV orchard studio in the Paro Valley become a reality. HummingbirdTV is ensuring a positive and healthy future for the children of Bhutan. 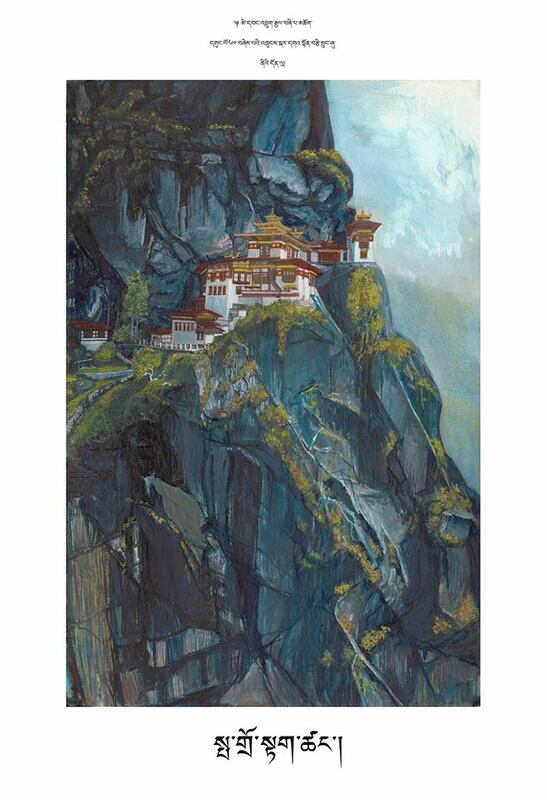 From dreams to reality, Paro Taktsang embodies strength of spirit, evoking meditations on life’s possibilities. Bhutan’s recorded history starts with the stories of Padmasambhava flying here on the back of a tigress. It is the “Copper Mountain” of legend, the place of saints. We are now able to offer printed versions of this painting to raise start up funds for a wonderful new children’s TV channel. HummingbirdTV.com is a commercial-free, non-violent television network for kids.